During winter break when I was thinking about what Christmas-y things I wanted to bake, a lot of things that came to mind had really nothing to do with the holiday. (Have I mentioned yet that I'm really slow to update btw?) 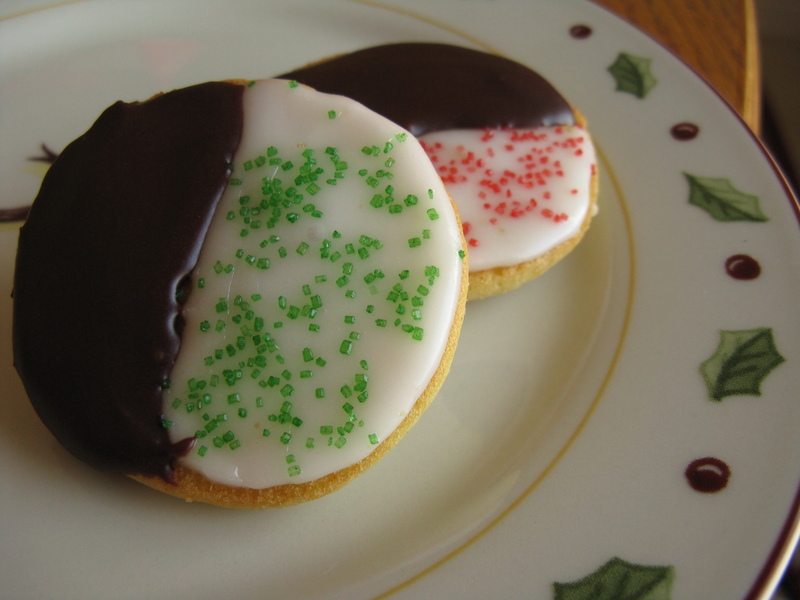 But something that I really really wanted to make again were the black and white cookies that NYC is known for, because I just really adore them. Their soft cakey cookie topped with a sweet and mildly tart combination of vanilla lemon and chocolate icing that has a perfect little crunch when you bite into it. It's divine really, especially when fresh. 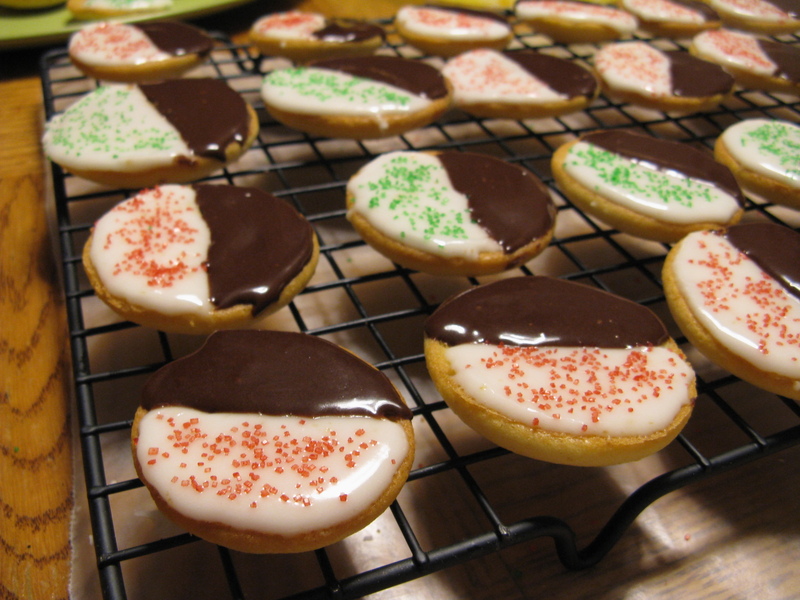 I've made black and white cookies once before, in the traditional giant cookie size. But for Christmas, I thought I would switch it up a little with mini cookies, sprinkled with Christmas colored sugars on the white side to jazz it up with some holiday spirit! I also decided to give a different frosting recipe a go, which turned out much better than the first recipe, in my opinion. 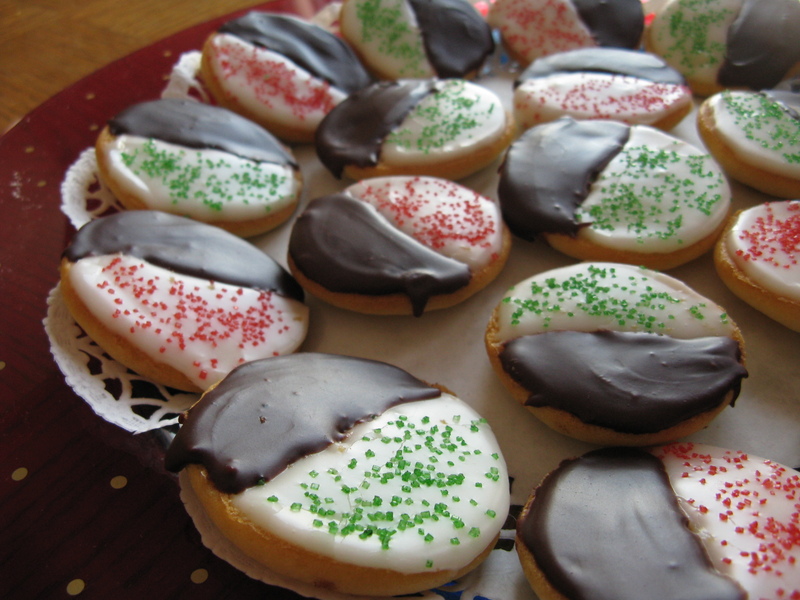 These disappeared fast… I think their small size makes them really tempting to reach for whenever someone passes by the platter in the kitchen :P Anyway, with these cookies you can substitute any type of colored sugar for various holidays (pastels for Easter anyone?? ), or leave them naked for any occasion. 1. Preheat oven to 350deg F. Grease baking sheet or line with foil. 2. Combine dry ingredients (flour, baking soda, and salt) in a bowl. Separately, mix together buttermilk and vanilla. 3. Beat butter and sugar in a bowl with an electric mixer on med-high until pale and fluffy (~3 mins). Add egg and beat until smooth. Reduce speed to low and add flour mixture and buttermilk mixture in alternating batches, beginning and ending with flour mixture. Mix just until smooth. 4. Drop batter by rounded teaspoonfuls, 1 inch apart onto baking sheets. 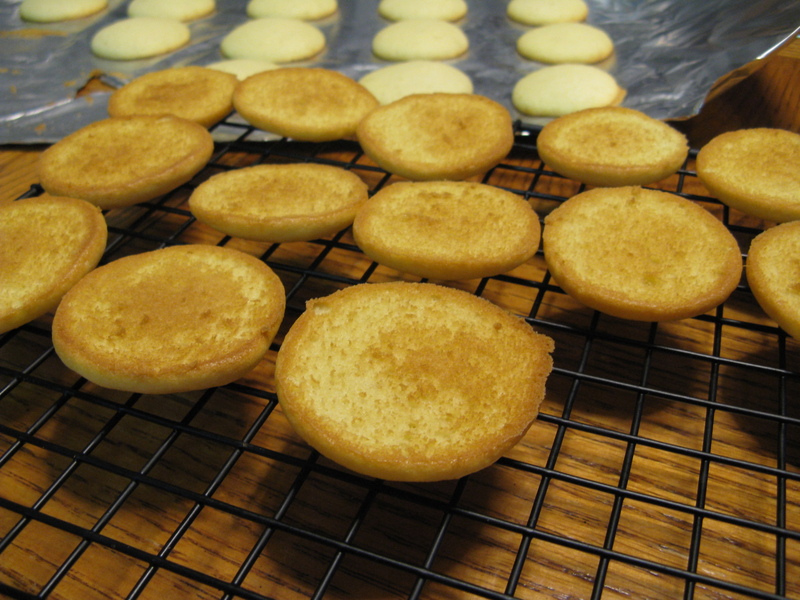 Bake until tops are puffy and edges are a pale golden (cookies should spring back when touched, see picture below, in the back). About 6-8 minutes total. Transfer to cooling rack with the flat sides up, the bottoms will be a golden brown. 5. Meanwhile, make the icings. Start with the vanilla icing: stir together confectioners sugar, corn syrup, lemon juice, vanilla, and 2 tbsp of water in a small bowl until smooth. 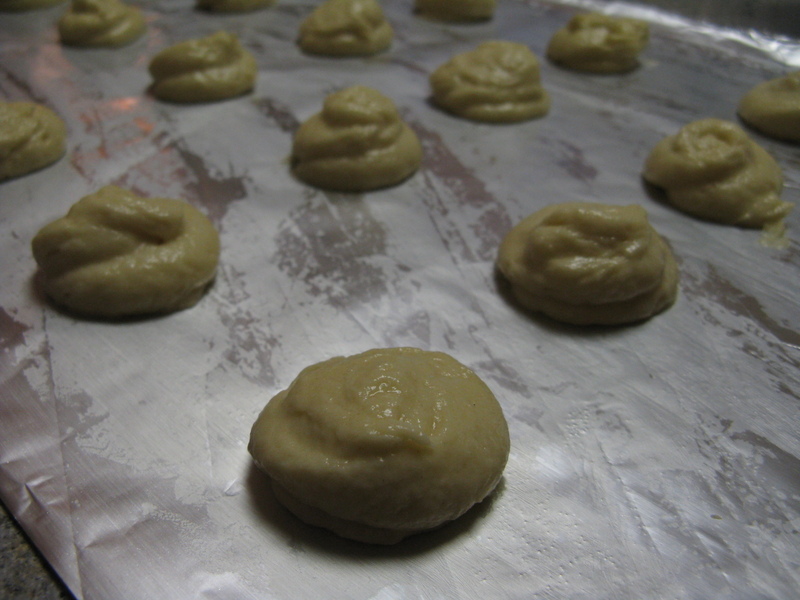 Add more water (1/2 tsp at a time) as needed until icing becomes a spreadable consistency. 6. (This departs from the original recipe, but trust me from experience, it makes sense). Transfer 1/3 of the vanilla icing to a second bowl, and stir in cocoa powder. Add more water, 1/2 tsp at a time, to reach the same consistency as the vanilla icing. Cover surfaces of icing with saran wrap if not using right away. 7. When cookies are cool, use a butter knife or small spatula to spread vanilla frosting on one half of all the cookies, on the flat side (that's right, the rounded dome side is the bottom of the cookie!). If you frost the rounded side by accident the frosting will just slide off. Sprinkle on colored sugar as desired. Set on wire rack to harden a bit. 8. Finally, frost the other halves of each cookie with chocolate icing and let set completely. Happy munching! This entry was posted on Friday, March 20th, 2009 at 9:27 pm	and posted in American, baking, desserts, holiday, recipes, Uncategorized. You can follow any responses to this entry through the RSS 2.0 feed.